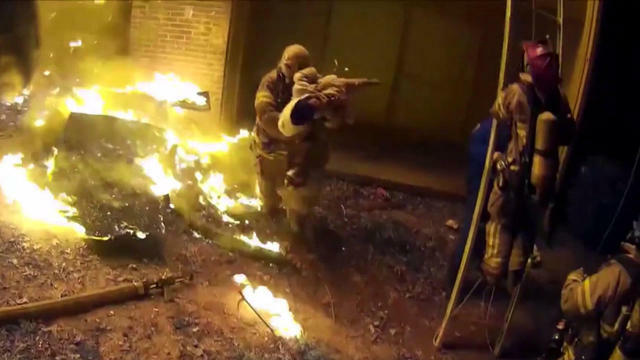 A dramatic scene of a Georgia firefighter catching a child dropped from an apartment fire was captured on another firefighter's helmet camera. The video was posted to social media Sunday by the firefighters' union in DeKalb County, outside Atlanta. In the video, third-generation firefighter Capt. Scott Stroup catches the young child dropped by a parent who was climbing down a ladder from a third-floor balcony early on Jan. 3. Stroup then carries the wailing child away from the burning building, collapsing onto his knees. He wasn't the only firefighter to catch children trying to escape the blaze. "We were catching babies like a football - literally," fire Capt. Eric Jackson told reporters at the scene. "There were adults that were on the balcony that were dropping their babies right into our arms. We had a couple firefighters catching babies, so it was just really incredible." About a dozen people were injured from the blaze, mostly related to smoke inhalation.